Proposed registration as at 06/18. 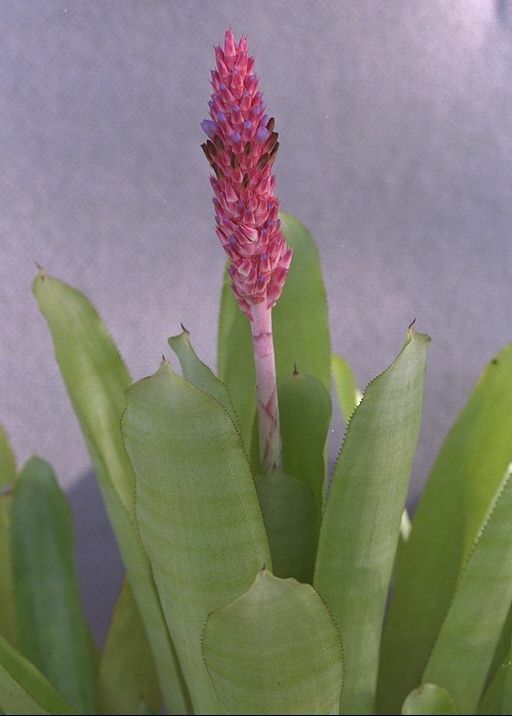 In 2017 a question was asked about Aechmea glutinosa “is it still being grown in Australia?” This is important as the last photos taken of this plant when a web search was done were from 20 years ago by Peter Franklin. On checking the Pinegrove Ledger we found BBK #691 Ae. glutinosa, 1983 and also a U.S. import from Seaborn in 1987, did we know if it was still being grown? Yes it is still here at PineGrove in abundance as we also still have growing in our gardens plants acquired from Peter Franklin in the late 1990s. That is the importance, it is still in cultivation. Next issue is how to treat it regards naming as Ae. glutinosa is not accepted under I.C.N Rules, therefore it must be recorded under I.C.N.C.P Rules and be placed in the BCR as Aechmea ‘Glutinosa’. For several years now I have corresponded with Mike Wisnev in California and Mike is one who loves wandering around Huntington Botanical Gardens, checking on labels. He did great work with Hechtia and Puya encouraging specialist botanists to visit and comment on his findings. In between these discussions he looked at the not so prickly types and many were hybrids with little data held in the Huntington files. One such problem cropped up in August 2017 when I got sent a photo of Aechmea distichantha x phanerophlebia. This had never been recorded nor given a Cultivar name. 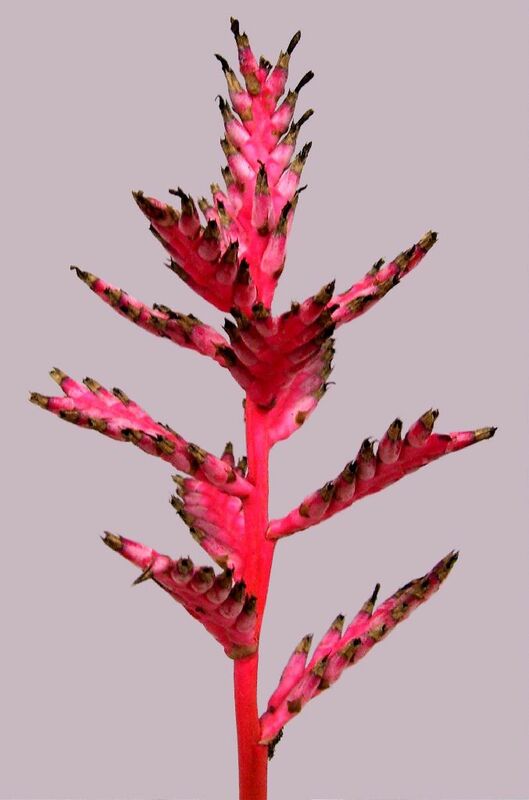 Aechmea distichantha is a bag of worms that Peter Franklin and I tried to solve years ago. We ended up with a bag load of notes but no action was taken. One plant which we kept separate was called Ae. glutinosa and now is the time to see what Peter reported. For Peter’s article in full refer: Bromeletter 37(1), 6-8, 1999. Peter acquired this plant in the late 1980s but unfortunately could not find reference to it anywhere in any written literature available at the time. A few years later it was noticed another acquisition labelled as Quesnelia sp ? 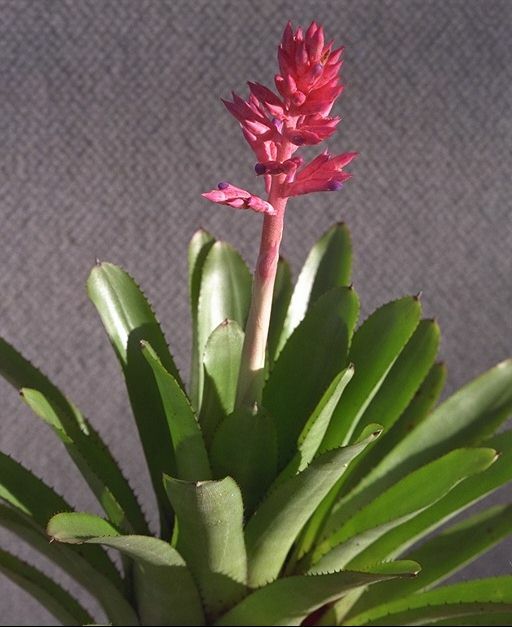 ‘OF’ looked very similar to his Aechmea glutinosa. Eventually both plants flowered confirming they were the same. But what ?? Using his Smith and Downs Monograph Peter tried to key out his Ae. glutinosa ending up at Ae. distichantha. It wasn’t an exact match to the description for Ae. distichantha species or any of its varieties or forms. Aechmea glutinosa doesn’t match any Ae. distichantha grown in collections in Australia either. As time passed Peter kept searching and comparing his mystery plant with descriptions that indicated similarities to his plant e.g. Ae. wittmackiana and Ae. jucunda a synonym of Ae. wittmackiana. Close but not quite. Peter: “The main differences among all the photos, the descriptions and the cultivated Ae. glutinosa are in the width of the leaves, the thickness of the scape, the relative length of leaf versus scape and the extent to which the plant is stoloniferous. The floral parts are essentially all the same. However, as with most naming exercises, I ended up with as many issues, anomalies and problems as I started out with. But at least I am reasonably satisfied that Ae. glutinosa (and Quesnelia sp? O.F.) has, at last, a place in the spectrum of Aechmea species as Ae. wittmackiana”. Plants grown in Australia as Ques. wittmackiana proved to be Ae. Wittmackiana and are not a match to Peter’s Ae. glutinosa or Ae. glutinosa imported by Pinegrove from the US in 1987. There has also been inferences of our Ae. glutinosa possibly being of hybrid origin which are unfounded at this stage. Because we know that ‘Glutinosa’ is growing in Australia it needs to be registered in the BCR. Registering ‘Glutinosa’ we would say it is strongly related to Ae. distichantha, origin unknown but probably found in the wild. See Kent's Nursery (California) Catalogue 1979 where it is listed as Aechmea glutinosa species. The plant grows to about 50cm high with leaves 45cm long x 90mm wide. Peduncle to 70cm long x 9mm thick. The fertile part of the inflorescence is 12cm long x 45mm diameter.